One of the biggest items that the campaign was able to support is something a patron would not even notice. Close to $115,000 went to gallery lighting!!! It’s rather like buying tires for your car – they aren’t pretty, you aren’t going to “ooh and ahh” over them, but if you don’t have them, you aren’t going anywhere. Gallery lighting is so important and it can be difficult to find the right mix of qualities. The lighting system must ensure the exhibits are well-lit, while creating a pleasant ambiance, not damaging artifacts and also being eco-friendly. Imagine this exhibit with poor lighting — the figures would be in the shadows making the scene less dramatic. The addition of the various life-cast figures made many of the exhibits come alive. 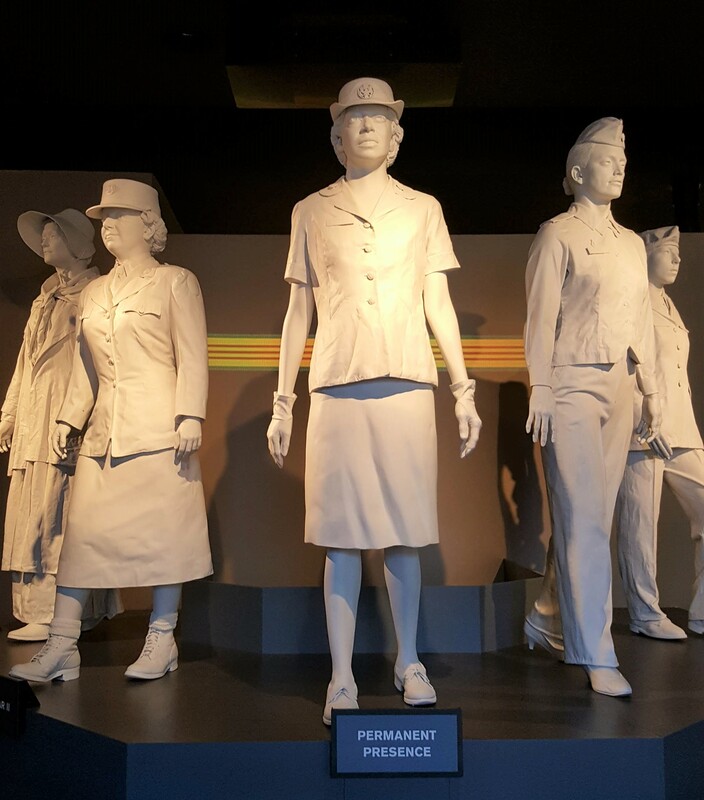 As a museum patron enters the gallery they are met by the women of the five eras representing the various galleries – Origins of Service, World War II, Permanent Presence, Be All You Can Be and 21st Century. These figures were created by a design company using live models to get the body forms. Then, the museum staff obtained authentic uniforms, patches, shoes and other items that were treated in order to dress the figures for the eras they represented. Some clothing items were purchased, others were donated. This “Stepping Out” exhibit cost close to $80,000 and is considered a focal point of the museum. These life-cast figures and some of the others were only possible because of generous donations. The Reflection Garden was the personal vision of Dr. Bonnell’s. The area was transformed into a peaceful setting where people wander leisurely taking in nature and history. The garden is enhanced by honor benches, ten historical plaques featuring stories about Women In War, a commemorative plaque for the contribution of flora native to Alabama. The main feature installed was the tribute monument honoring the 14th Army Band (WAC). 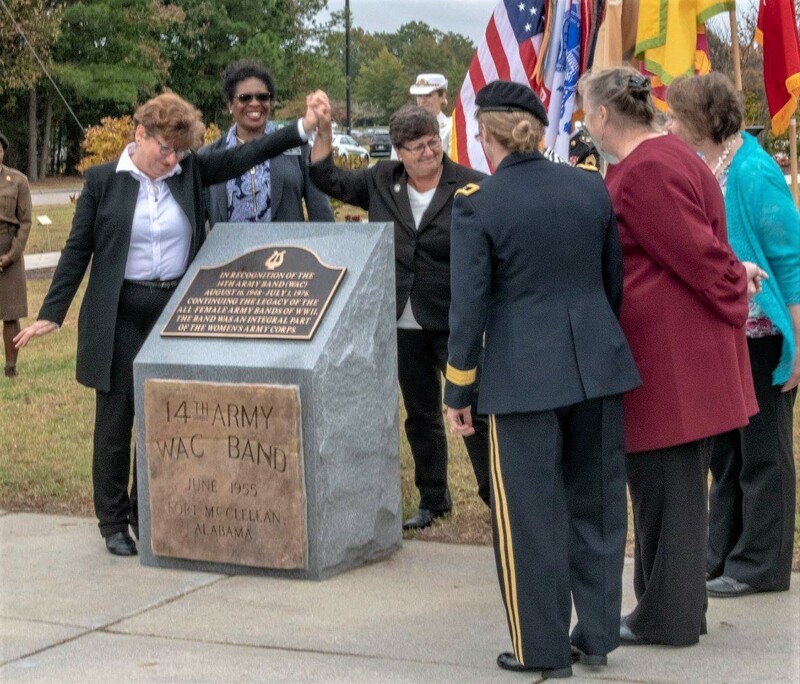 The monument was designed to incorporate the original band plaque from Fort McClellan. To get the garden ready, a landscaper cared for the plants and bushes, weeded and did some much needed mulching. Approximately $21,000 of contributions was used to create this outdoor exhibit that proved popular during the grand opening and thereafter. It was even the site for the FAWMA hosted luncheon on the Saturday following the big event. The gift shop was upgraded to better serve museum goers. We’ve added easy access display cases that are much better for showing the various items on sale. We are always on the lookout for new items to add to help celebrate Army women and the museum. We have a variety of polo shirts, hats, postcards and other items that will help people remember their visit. 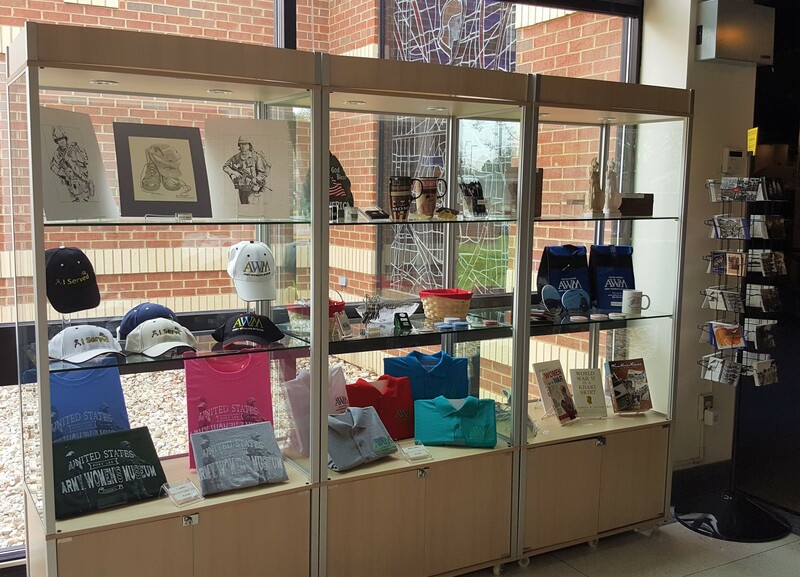 We spent about $9,000 on the gift shop but we consider it an investment as it will continue to help support museum needs with each sale. 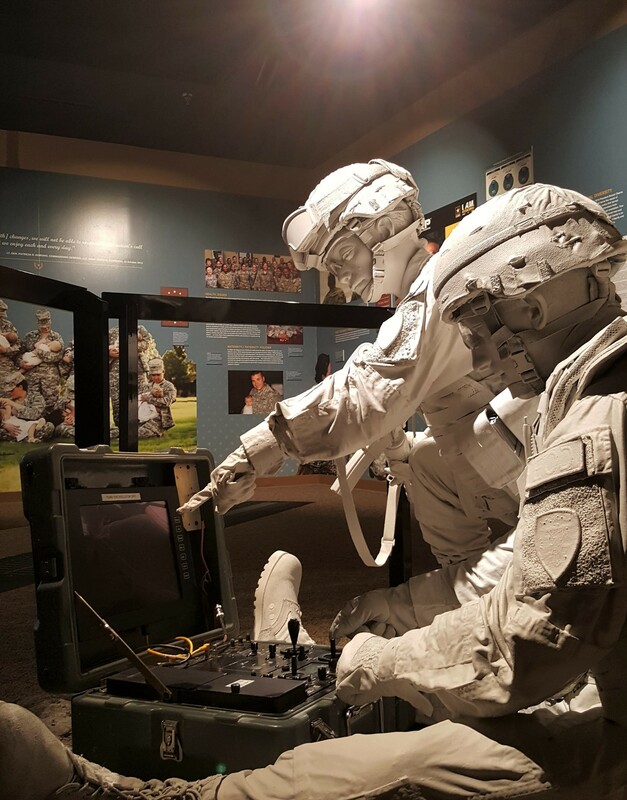 About $18,000 was spent on general services and supplies to buy items for exhibits. There were numerous items but these are good examples. FAWMA covered the costs for transporting/restoring the OH-58 helicopter. Benches were added through the museum for the comfort of visitors as they watched some of the videos. Voice actors were required to record dialogue to bring the exhibit to life along with professional audio video services. A plaque was created to dedicate the Mary A Lee Gallery as well as set up the paintings done by a WWII WAC, Sergeant Ann B Tilson. And lastly, overall reunion social events as well as the official ribbon cutting reception cost about $9,000. As you can see, the grand reopening could have never happened without all the donations from supporters – corporate, charitable foundations and individuals. We will be continuing with mini-fundraisers to covers costs for additional items identified by the museum director and staff. More information will be provided soon and we hope you will continue with your support!